Recreational vehicles offer the thrill of the open road and a sense of adventure about their final destinations. Unfortunately, their sheer size means that most people simply don’t have the space to keep a large RV parked at their residences. That’s why the small camper featured in the video below is so exciting. Watch as she pulls the handle out….pretty amazing! 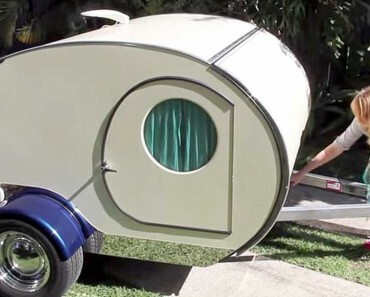 It’s called the Gidget Retro Camper, and it was created by an Australian developer. The camper has a television entertainment set and a kitchen complete with a sink and refrigerators. Some models even include showers with hot water. Powered by solar panels, they’re great options for people looking to reduce their carbon footprint. Pay close attention as she reveals the rear portion of the camper. The rear camper shell can double as an overhang that will provide some shade in the sun, or some shelter in the rain, for whomever ends up cooking out back. If you’re camping somewhere windy, there’s even an accessory windshield that isn’t featured in the video, but is available to protect whatever you end up cooking on the stovetop. Perhaps its best feature is that it won’t break the bank. While the average brand-new RV costs over $100,000, the Gidget seems positively reasonable, retailing at only $15,000. This entry was posted in Campers, Home. Bookmark the permalink.